From the October 2015 Desktop News | Dr. Catharine Stimpson, a pioneer in the study of women and gender and a founder of feminist criticism, will present “Waging War, Making Peace, Doing the Humanities: Why ‘Macbeth’ Matters” Thursday, Oct. 15 at 7 p.m. in room 205 of Gorgas Library on The University of Alabama campus. Hidden Humanities was founded in 2014 to bring nationally prominent scholars and writers to UA to discuss the so-called “crisis in humanities.” Each lecturer is invited to address, head on, the positive contributions of the humanities to society at large. Stimpson is a University Professor and dean emerita of the Graduate School of Arts and Science at New York University. She is known for her wide-ranging writing on the humanities, liberal arts and the university. Her most recent book, Critical Terms for the Study of Gender, which she co-edited with Gilbert Herdt, was published by the University of Chicago Press in 2014. At NYU, Stimpson is a faculty member in the Steinhardt Institute for Higher Education Policy and is an affiliated faculty member of NYU’s Law School. She previously served as director of the fellows program at the MacArthur Foundation in Chicago; University Professor, dean of the Graduate School and vice provost for graduate education at Rutgers University; and director of Barnard College’s Women’s Center. She is the founding editor of Signs: Journal of Women in Culture and Society, author of the novel Class Notes and editor of seven books. 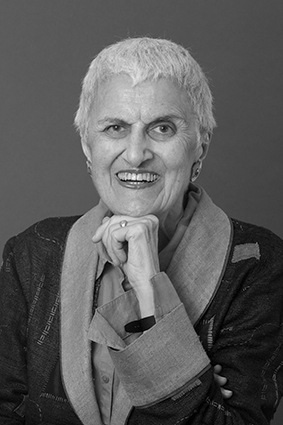 She has published more than 150 monographs, essays, stories and reviews in publications such as Transatlantic Review, Nation, New York Times Book Review, Critical Inquiry, and boundary 2. She has served as chair of the New York State Council for the Humanities, the National Council for Research on Women and the Ms. Magazine Board of Scholars; president of the Modern Language Association and the Association of Graduate Schools; chair of the board of the innovative arts organization Creative Capital; and member of the editorial group of Change magazine. She is now a member of the board of directors of several educational, philanthropic and cultural organizations and is a former member of the board of Public Broadcasting Service, or PBS. She received a bachelor’s degree from Bryn Mawr College, bachelor’s and master’s degrees from Cambridge University and a doctorate from Columbia University. She also holds honorary degrees from Upsala College, Monmouth College, Bates College, Florida International University, the State University of New York at Albany, Hamilton College, the University of Arizona, Wheaton College, Hood College, Union College, Holy Cross College, Santa Clara University, Rutgers University, Emory University and Simmons College. The goal of the Hidden Humanities series is to challenge the widespread notion that the humanities ought to be a low priority in education. The lectures are intended to clarify the nature of the current debate over the importance of the humanities and shed new light on why intellectual disciplines at the heart of the modern university now appear to be so undervalued.